Hovering over a busy intersection is a large white nondescript building. 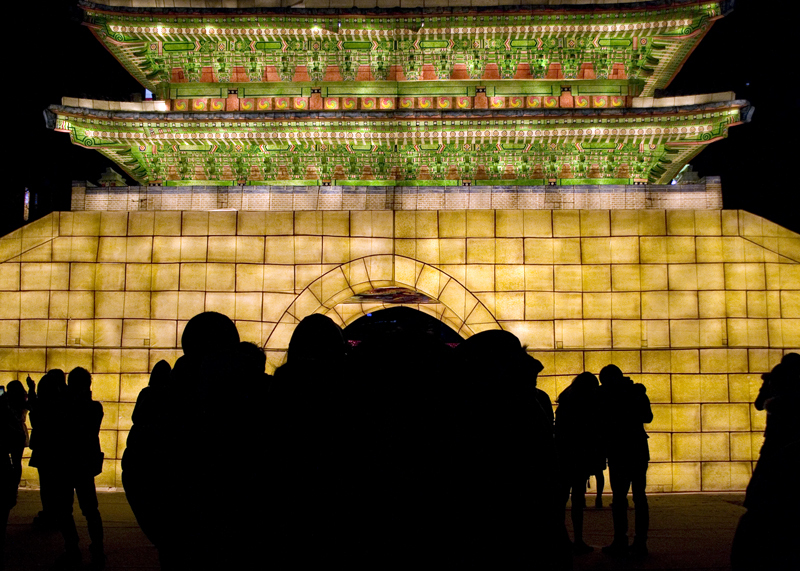 Every time I have visited Insadong, its’ location over a steady flow of traffic has always struck me as peculiar. Like seeing an enormous flamingo perched in the middle of a city, you want to ask it why it is there. You will never get a decent answer but it is understood that it insists upon staying; inexplicably crouched instead of at rest like any other building around. Barret and I were in the neighborhood in search of the Silver Cinema. After retracing our steps a few times, we finally realized that by default it was inside that hovering white arcade over the street. Up we went to the 4th floor terrace and into the courtyard. As the building is famous for musical instrument stores, there was a small stage and a music studio across from the ticket booth. Even inside the small, dated theater lobby the floors vibrated from a neighboring musical production Sachoom. As we waited, the empty lobby suddenly swarmed with a geriatric populace. I turned to Barret with a worried look. “I don’t know, but this says something about being 55.” I responded while indicating the cinema’s flyer. We approached the counter like minors sneaking into an R-rated film and luckily our mature guise worked. Feeling confident of my new found antiquity, I decided to push my luck further when I saw the retro projection room. 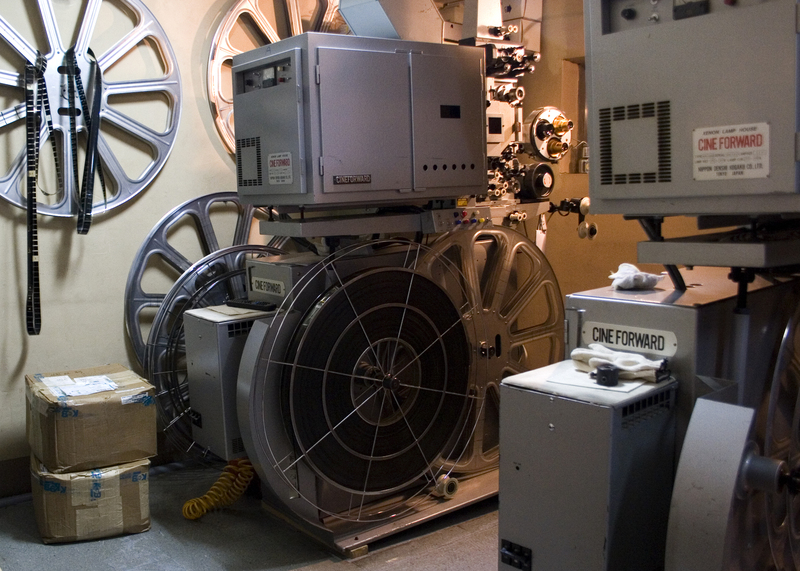 Enormous reels hung from the walls and although the equipment was old, it was maintained with such care that it gleamed. The projection operator spoke no English, but he allowed me inside and guided me to the best angles. He reviewed my photos with a zeal that I hadn’t seen since my college art classes. “No,” he seemed to say, “you have completely missed the essence of these machines. Try it again.” After several rounds of disapproval he finally approved and I thanked him as I left to take my seat. Despite my feigned scorn of the French, I have always secretly harbored a daydream of being in Paris on a rainy day. In this scenario I decide to spend the afternoon alone in a theater watching pretentiously artsy foreign films and feeling generally quite pleased with life and myself. I have not made it to France yet, but watching Mogambo (a classic Hollywood film shot in Africa) in Korea comes very close to that benchmark. I enjoyed every minute of the ridiculous love quadrangle as well as the juxtaposition between movie stars and the jungles of Africa. It was just as titillating and ridiculous as it must have been 60+ years ago. Nearby the cinema was a restored urban stream called Cheonggyecheon. It is a fresh breath of greenery and nature in the middle of a dense city. After picking up a hot latte to warm our hands, Barret and I descended down from the street to see the last night of the Seoul Lantern Festival. 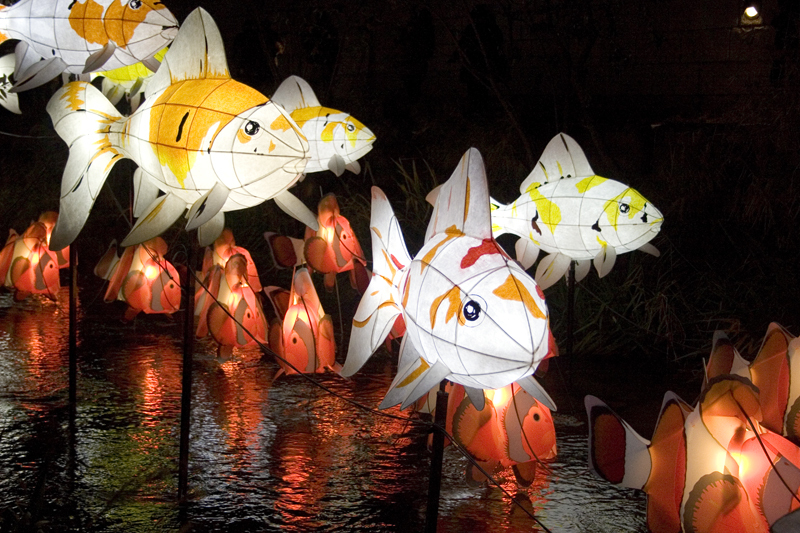 From metal platforms in the middle of the stream, the giant lanterns illuminated the gurgling water and cast a false warmth onto the surrounding stone embankment. Despite the chill winds rushing down the channel, we viewed the entire display which ranged from traditional Korean folklore to contemporary animated characters. While our romantic stroll ended with runny noses and numb limbs, it was a beautiful winter evening in the heart of a city that never sleeps. Silver Cinema: Lines 2,3, & 5 Jongno 3-ga Station, Exit #5. 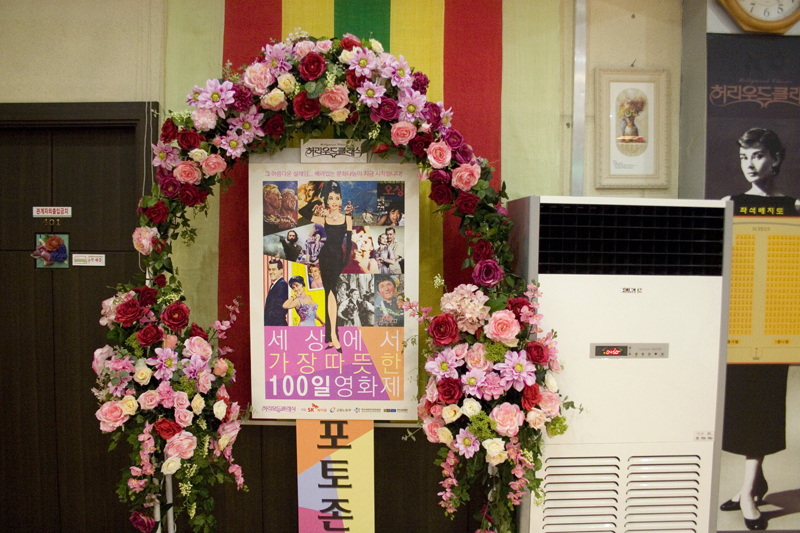 The movie theater is on the 4th floor of the Nakwon Arcade ahead. Cheonggyecheon: The stream starts at Line 5 Gwanghwamun Station, exit #5. Again, interesting choice for an article. Really like the lantern festival photos. Thanks for the detail of your experience. I recently returned to Seoul from US for a year in need of care for my elderly mother. One of the things I wanted to do while I am here is to watch some of the old Korean movies as well as oldies of foreign movies. My younger sister who lives in YongIn brought me a flyer contains the information of the Hollywood theatre you are talking about here. I will be sure to visit the theatre in near future, and I will find the difference between the theatre I used to go in my twenties which was 45 years ago and now. The flyer doesn’t talk about the lantern ceremony, but I am planning to find out when this happens, if it isn’t too crowed, I shall give it a try. Recently, I took a walk to Chungaechun from Damsimni end, and was so happy to see the change, and enjoyed the nature around. Have fun at the movies! I really like the location of the theater- there are some good vegetarian restaurants in Insadong. The lantern ceremony only takes place once a year. There will always be a bunch of people, but it you go just after it opens it will be less crowded. I heard the last weekend it was open it was packed.